The earliest records of a solar and lunar eclipse in ancient Chinese history date from 2165 – 1137 BC. The Moon is a symbol in Chinese philosophy and arts rather than simply a planet in traditional Chinese culture. From ancient myth Chang’e to Poets from Tang & Song dynasty, the Sun and the Moon together become a pair symbol of Yin & Yang philosophy. Studio HVN “Eclipse” rug design for TAN was inspired by solar and lunar eclipse. 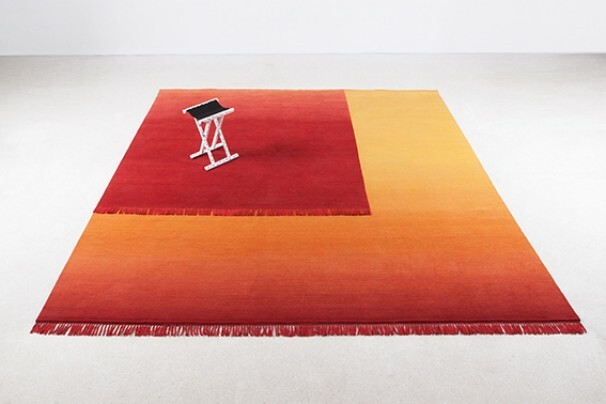 The design creates an eclipse of two rugs seemingly overlapping each other made in three different shapes and colors. Each piece is an eclipse in a different stage of being, representing from early losses to total eclipse. The collection together represents the gradual happening of one full eclipse. The products are handmade in Nepal by skilled craftsman over a time period of four months. Through a process of spinning yarn from Nepalese wool, dying the fibers, and hand knotting, the rugs are slowly made to high quality interior products. one rectangle overlaps another that makes a full eclipse.